The only thing it can't do is check under your bed for monsters. Sleep tracking has never taken off the same way activity tracking has, probably because no one wants to wear their smartwatch to bed. (That's when you should be charging it anyway.) The Zeeq from REM-Fit aims to fix that by taking the tech off of your wrist and putting it in a place that's a lot more comfortable when you're asleep: inside your pillow. 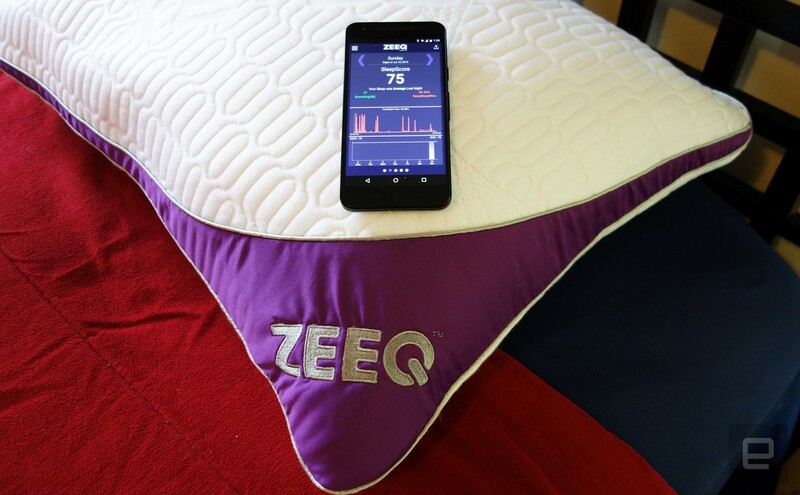 The Zeeq, which hit Kickstarter today, isn't the first smart pillow. However, most sleep devices tend to focus on fixing one problem, and they can be pricey. Zeeq packs enough features to justify replacing your current bedding setup. It'll track your motion and the volume of your snoring, calculating a "SleepScore" to indicate the overall quality of your rest. 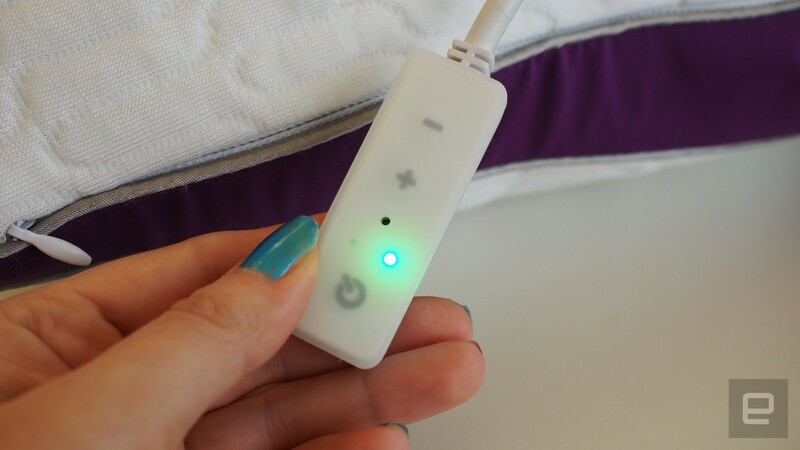 But the Zeeq isn't a passive observer of your nights: Speakers inside the pillow make it so you can fall asleep to your favorite tunes, and a motor inside vibrates to wake you up or nudge you to stop snoring. In fact, music is why REM-Fit's director of technology, Miguel Marrero, hacked together the original Zeeq prototype in the first place. He finds it hard to sleep without some music playing in the background -- a state of affairs that doesn't make his wife very happy lying next to him. So he came up with the idea of putting a speaker inside the pillow that only he could hear. 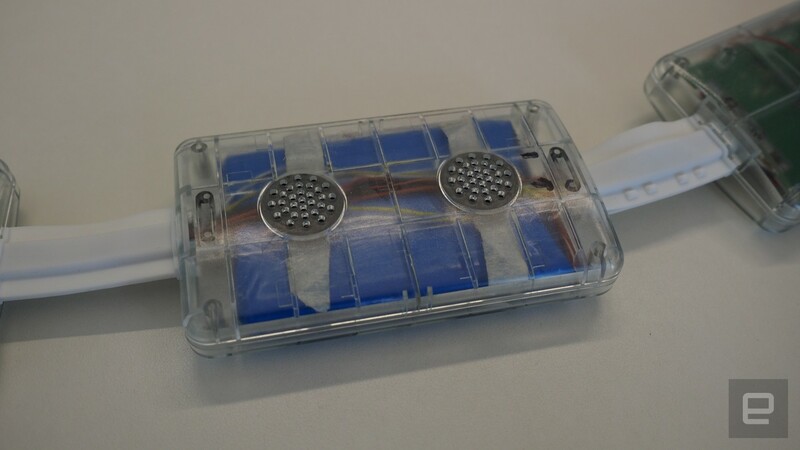 But while he was in there, he realized he could pack a lot more into the hardware, so he did -- tying it into REM-Fit's existing monitor system as well. Because REM-Fit is a subsidiary of Protect-A-Bed, a manufacturer of mattress protectors, Zeeq doesn't slight its bedding aspects in any way. 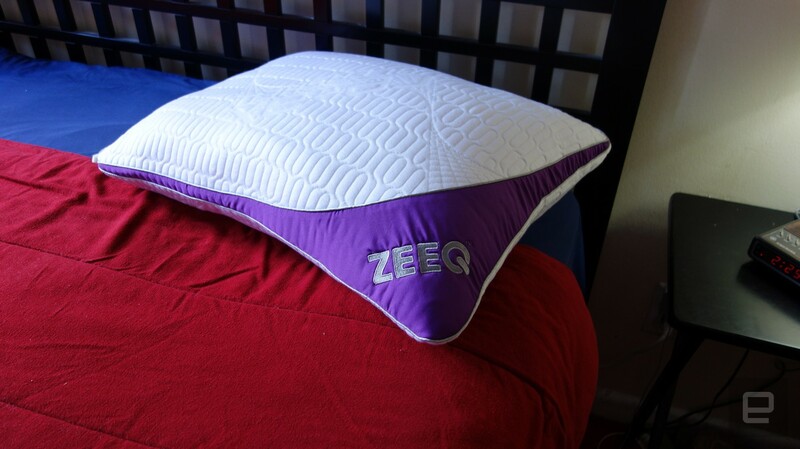 At first glance the Zeeq looks like any other premium king-sized pillow, with a quilted outer cover and a stylish stripe of purple fabric running down each side. The cover is removable for easy laundering, and the interior of the pillow itself is easily accessible via a series of zippers. The pillow is filled with shredded memory foam, which makes it easy for users to customize the exact shape of the bedding to their individual needs. In fact, that was one of the first things I did before spending four nights with the Zeeq, gutting its Grimace-colored innards to get it to a height that would be more friendly to my neck. 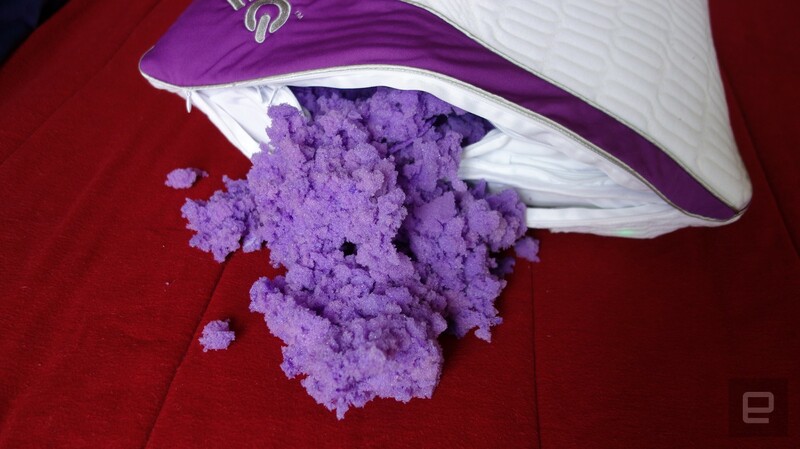 If that sounds somewhat grisly, it should: The memory foam was extremely messy, sticking to my hands and leaving little bits of purple fuzz all over my bed. However, I did appreciate the options the Zeeq's design gives you. Being able to launder the cover and replace the innards means that you can use it for a lot longer -- justifying the extra cost that the embedded tech adds. Buried deep within the Zeeq are three loosely connected speaker pods. The whole thing is jointed so that users can fold up their pillows if they so desire -- yet another sign of REM-Fit's desire to put sleep first and make this thing as flexible and comfortable as possible. The speakers are a bit large, but they're buried deep enough that the sound doesn't extend far beyond the surface of the pillow. Someone sitting up or lying next to you wouldn't hear a thing, unless you cranked up the volume really high -- high enough that even you couldn't get to sleep. However, I could hear the motors in the pillow quite well from across the room. Not a roar but still distinguishable when I was testing the various functions in the app. Zeeq doesn't require that you take advantage of all of its features. You need the iOS or Android app to set them up, though. A small remote in the Zeeq itself permits some basic functions: on/off, volume and starting a sleep cycle. But the team behind the smart pillow would prefer you use the app, if only because of the wellness survey the app presents in order to build a more complete picture of your health. Questions include how stressed you are, how much you exercised that day and how much alcohol you consumed. In the long run it's useful, but when you're exhausted and want to drop off to dreamland, it can be annoying. What's more, I haven't seen any way to skip the questions and answer them later instead. During my time with the Zeeq, I used the app exclusively to start my sleep cycle and experiment with the various functions. Unfortunately for this hands-on, I don't snore, so I couldn't tell you if that alarm actually works. My roommate took a pretend nap on the pillow, which registered his fake snoring, but the snore alarm never went off -- possibly because he was never deeply asleep and the pillow detected that. The first night I elected to try out the music. The app lets you set up a playlist that can draw songs from three sources. The first option, "Zeeq Sleep Tracks," is a selection of free mood music and sound effects. The second option, "Music," is whatever's available on your phone, while a third option is available to Spotify Premium users, allowing them to connect their account and stream music to the pillow from there. I don't pay for Spotify, so I opted to use tracks from my phone. Unfortunately, all of my downloaded music is in my Google Music account, which is invisible to Zeeq. (There went my idea to fall asleep to the Hamilton cast recording.) Since I lacked the patience to load tracks directly into my phone's storage, I decided to give the Sleep Tracks a try. I downloaded a selection of forest noises and lay down. And it was nice, for a bit. The sound of leaves in a breeze and the murmur of insects was soothing enough, a pleasant change from my usual soundtrack of traffic. However, there was this one particular bird noise working against me: Every time I started to drift off peacefully, the bird would trill, pulling me back to wakefulness. Luckily, the music was only set to play for 15 minutes, so I was still able to get a good night's rest. The pillow was comfortable too, though I realized I needed to rebalance the stuffing, as one side was underfilled. My morning was a little less restful. The Zeeq has two types of alarms: a normal alarm that you can set to have the pillow vibrate at a certain time, and the SmartWake function, which will wake you up a bit earlier if it senses you're starting to stir early. This is meant to match your body's natural sleep cycle and keep you from falling into a deep sleep just before your alarm goes off, which is normally a recipe for extra crankiness. It's a great idea, but I never got to experience it personally while testing the pillow. What did happen that first morning, though, was that the vibration went off and it was absolutely terrifying. Worried that the lowest setting might be too subtle to wake me up, I had set the vibration level to "high." My skull was rattling as a result. I bolted up in bed, frantically searching for the pillow's remote and mashing the button repeatedly to make it stop. I might actually prefer an obnoxious morning radio show to the sheer terror I felt here. The next day I set the vibration lower and added a new weekend alarm time for 10:15AM. Unfortunately, I didn't actually wake up until after 11. I have no idea if it was too subtle for me to notice and eventually stopped or if it even went off at all. Once I got out of bed I opened the app to shut down the sleep cycle, only to see no data had been recorded on the Zeeq that night -- or the previous one. After a third night of no recorded data I got in touch with the Zeeq team and did a bit of troubleshooting. They gave me a new version of the app and also instructed me to reset the pillow. One or both of these did the trick: A few test sleeps mid-afternoon yielded data, which meant I was good to go on Sunday night. It should be pointed out that while you can start a sleep cycle at any point during the day, only the last one seems to be reported as the official sleep record for that particular date. This morning I woke up before the alarm. It did go off, at least, but I can't tell you if the lower setting was too little or too much, as I was already out of bed. I also now have one night of data, and my sleep on Sunday night was merely "average," with 5 1/2 hours of deep sleep. At around 1:34AM it also registered a noise of 77db, though it only lasted a minute, too short to be a proper bout of snoring: Had it caught me yelling into the other room to turn the TV down? I've been a loyal Fitbit user for years, and I still care about the sleep data it provides. If I feel crappy during the day, it's nice to be able to look at my stats and know that yes, I slept horribly the night before. But while Fitbit can tell you how well you slept, it can't make it any better. In that sense Zeeq is a godsend, because it's not only recording the data but also doing its part to make you sleep better through thoughtful bedding design and some nice little features. It might not be able to turn down your sheets and fluff your pillows, but it's certainly the next best thing. Zeeq's Kickstarter starts at $99 for early bird backers, down from the eventual retail price of $299. You won't have to wait long for that good night's rest, either: The Zeeq is set to ship to backers in December, just in time for a long winter's nap.